Xela to Santa Cruz del Quiche. Bus leaves from the main chicken buses station in Quetzaltenango. It will take around 1 hour 30 minutes with a stop in Los Encuentros. Price Q25 per person. Santa Cruz del Quiche to Uspantan by chicken bus took us a lot! There were construction works on the road and we had to stop on the road for more than an hour! Price Q30. 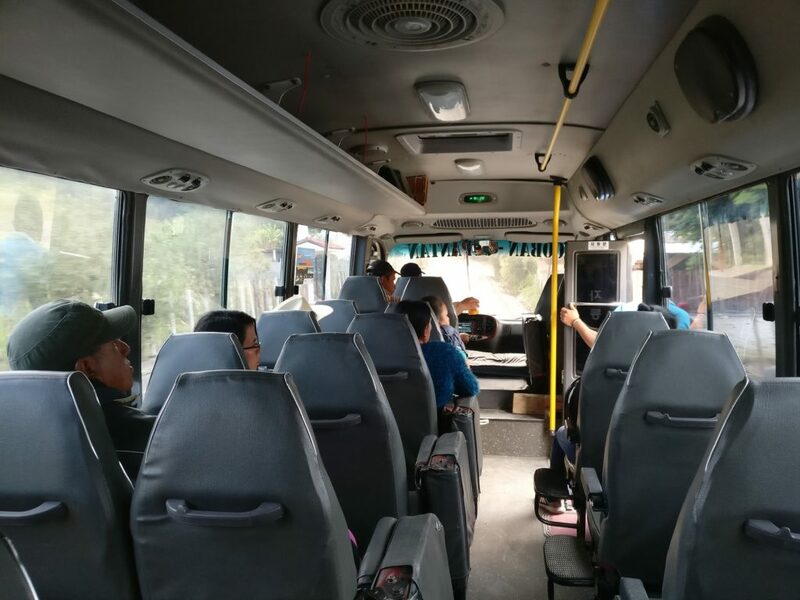 Chicken bus from Uspantan to Coban. As we started from San Marcos and did it quite late, there were construction work on the road we had to break our journey in Uspantan. Although, we spent a night in a nice hotel called Don Gabriel for Q100 (double room). Uspantan to Coban takes around 3 hours and the price is Q30 per person. Coban to Lanquin. You will have to walk to another bus station from where you have been dropped. It will take around 7-10 minutes by foot and you can get some snacks on the way. It will take you another 3 hours until you will reach Lanquin. You can either stay in Lanquin or one of the hotels near Semuc Champey (for example Utopia). There are pickups and other cars going there from the main crossroad in Lanquin. Price varies between Q15 to Q25 per person. It takes around 30 minutes from Lanquin to Semuc Champey. We managed to catch one truck back for Q11 per person. One of the buses from Xela to Semuc Champey. This way of travelling from Quetzaltenango to Semuc Champey will take you more than 10 hours. You should start early and have plenty of drinks and snacks. I recommend to break a journey in lovely town of Uspantan or Coban city. Easier and probably much faster option is to take chicken buses from Xela to Guatemala city and Lanquin. Even the distance is much longer the length of the trip should be much shorter. I haven’t done this by myself as I don’t really like going through the same roads I’ve already passed. How long is from Xela to Lanquin through Uspantan? If you decide to take a route I took you should prepare Q115 per person. It is possible that we were scammed at some bus and it could be Q100-Q110. It will take you around 10 to 12 hours from Quetzaltenango to Lanquin. I recommend to break a journey in Uspantan or Coban. Haha – I’ve always love the term “chicken bus.” It sounds like a bit of an ordeal. How often do they stop for food and toilet breaks? What do people usually do if they can afford to spend a bit more money? They actually don’t stop for food or toilet breaks 🙂 I mean sometimes, when there are towns on the way there are bus stations and you can jump out and go to the toilet and grab some food. If they have more money and don’t want to explore country by chicken buses they either rent a car or take tourist shuttle buses which are more expensive and more comfortable. Great! Glad that it helped you. Have a safe journey!